Where would I be without California farmers? If it weren't for them, I would never have discovered the sticky, caramel bliss of Medjool dates, the tropical pina colada flavors of cherimoya, or the simple joy of munching on raw summer sweet corn. Yes, raw corn. At first, I was skeptical. Having grown up in New England, I was accustomed to bright yellow, fat kerneled ears of corn steamed to perfection and doused with melted butter and salt. But the LA farmer insisted I taste the raw corn he was offering: raw, white, small kerneled corn. How could such puny corn possibly be good without butter and salt? Still, I held out my palm while he filled it with a scoop of raw corn kernels. With one swift swoop of the arm, I popped the entire handful in my mouth. It was crunchy, as in snap! crackle! pop! crunchy and surprisingly juicy. As for the flavor, well, it was natural. Just unadorned, mildly sweet, old-fashioned corn flavor. I was hooked. That was about four years ago, and I still anticipate sweet corn season every year so I can nosh on raw corn. If you feel weird eating a raw cob of corn, then cut off the kernels and add them to salads and salsas, or eat them by the spoonful. Have them plain, or sprinkle them with lemon and cayenne pepper or lime and chipotle powder. Then give thanks for California farmers, well, actually for all farmers. Where would we be without them? This simple salsa celebrates the clean, fresh flavors of summertime. It's a natural pairing with seafood but is also delicious with chicken, beef, and pork. 1. Combine all salsa ingredients in a small bowl and set aside. 2. Preheat oven to 400 degrees F. Coat a large, rimmed baking sheet or baking dish with cooking spray. Place egg whites in a shallow bowl and lightly beat with a fork. In another shallow bowl, place cornmeal seasoned with salt and pepper. Pat fish dry with paper towel. Dip each piece of fish in the egg whites then dredge in the cornmeal until completely coated. Place on prepared baking dish and cook for 20 minutes, turning once mid-way through. The fish will be cooked when the cornmeal becomes golden and crunchy and the fish is opaque when pierced with a fork. 3. Place 1 1/2 cups mesclun on each plate. Place a fish filet in the middle and top with a 1/4 of the salsa. Repeat with remaining dishes. Alternative stove-top method: In a large skillet over medium heat, warm 1 1/2 tablespoons canola oil. Place fish in pan and cook for 4-5 minutes without touching. Flip once, and cook another 3-4 minutes, or until the cornmeal is golden and crunchy and the fish is opaque when pierced with a fork. White corn is very popular in South Africa, it's what is used to make our national staple food Mealie Meal.Great to see it used fresh. Never ever though to use cornmeal on tilapia. We eat tilapia about 2-3 times a week and this is a great way to shake it up! It's definitely a little bit weird eating corn raw off the cob... But SO delicious! I love this dish- mango salsa is one of my new favorite things! I love corn! Love, love, love. I barely eat it at home as my boyfriend hates it, but he'll just have to suffer through this one. It looks amazing! I had raw corn for the first time a few weeks ago and the corn was so ripe, so sweet that it was fantastic! I love the idea of cornmeal crusted tilapia, being the corn fanatic that I am! Delicious dish. That salsa sounds fabulous. It looks gorgeous over the fish. I will have to make something like this soon before our summer weather goes away. Thanks for the inspiration. I just recently discovered (here in New England, go figure!) the amazingness that is fresh, sweet, raw corn. It's definitely my new favorite addition to salads. 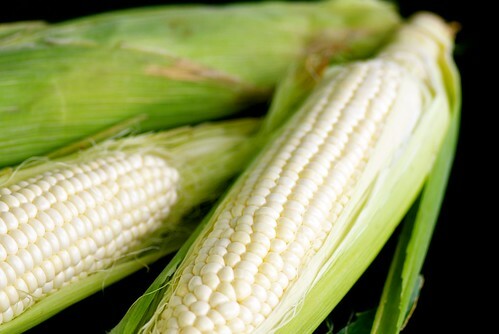 I have been eating sweet, white corn all week from our farmers market but I never thought to eat it raw. It would be delicious! rose-I didn't know that. Thanks for enlightening me! jessica-Yeah, we eat it a lot too. I just love the crunch of the cornmeal. thefrench-Doesn't like corn? How is that possible? cara-I love yellow New England corn too. val-Give it a try. You'll be so glad you did! You are so lucky to get such great corn! What would you substitute for the mango? I want to try this out and don't really care for the mango. What about tomatoes? It looks so delicious!